TZSB-Test site, Institute of Future Energies, Saarbrücken/Ger: stress test for Thermosiphon installations. Improvements certainly are desireable, since during bad weather spells backup heating often is required – usually powerd by expensive electricity. 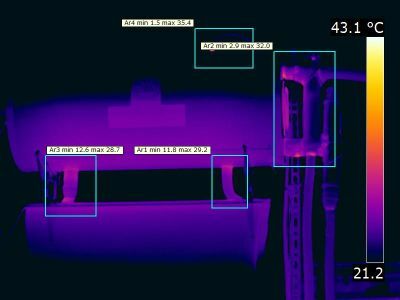 Since the hot water storage tank is exposed to wind and weather, it’s thermal losses generally are more pronounced than those of a classical in-house tank. As a result weak storage and pipe insulations in colder periods (winter or nighttime) result in considerable energy loss. On the downside, improved insulation can lead to extremely high temperatures during Summer. There even is a risk that the storage reaches boiling temperature and overheats. After all the solar energy influx cannot be easily stopped. However, a special thermostatic temperature limiter in the SECUterm system achieved just that. As soon as the maximum storage temperature is reached, the SECUterm thermostat closes off the feed pipe to the storage and the storage temperature remains stable. The storage and its integrated heat exchanger are designed to provide an additional expansion volume. 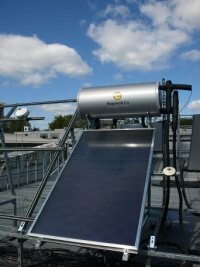 It stabilizes the system pressure even when vapour pressure forms in the collector and the solar liquid is pushed up into the heat exchanger. In contrast to classical thermosiphon systems all heat leackages have been thoroughly eliminated in the SECUterm. The return pipe is integrated within the collector, and pipe connections as well as heat storage tank feature seamless heat insulation. But is the additional insulation of these comparably small areas of importance at all? The Solar Keymark test and an additional thermographic analysis provided some insight. At the TZSB testing center in Saarbrücken, a branch of the renown Institute for Future Energy Eesearch, SECUterm’s performance was meticulously tested. 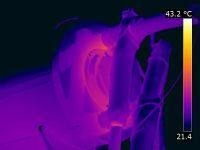 For example the heat insulation was examined by means of infrared imaging. Seamless return pipe and storage tank insulation. „Leaks“ would show as bright white. Heat leaks in the insulation can be easily located this way. The IR images during nighttime also prove that no nocturnal reverse circulation occurrs. It could occurr in case of an imbalance between absorber temperature and the temperature within an insulated external return pipe. But the return pipe of the SECUterm is integrated within the collector, which was specifically developed for this application. The design assures a temperature balance at both sides of the „communicating pipes“. Thorough examinations of overheat protection and stagnation behavior also are part of the Solar Keymark tests. The thermostatic circulation stopper also stood the test under conditions of extreme irradiation, without necessitating a cooling strategy, such as blowing off precious drinking water. Following the requirements of EN 12976 the performance of the system was scrutinized under real-world weather conditions. To allow an objective ranking of different systems, the determined values were then converted to standardized system locations and DHW consumption rates. 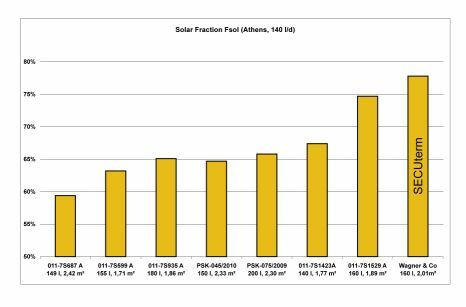 Figure 2 shows the solar fraction of all Solar Keymark listed systems for the standard location „Athens“ and the standardized DHW consumption rate of 140 l/d. Here the optimized heat insulation concept shows its true strength. With a solar fraction of 78% SECUterm clearly reaches the highest yield. By now the solar Keymark certification procedure is widely accepted within the industry and beyond, because the strict testing framework leads to an objective comparison of the available products. All data of the listed suppliers can be accessed at www.solarkeymark.org. Fig. 1: Above approx. 85°C the thermostat shuts off the circulation. Vapour forces the solar liquid into the tank. Fig. 2: In Athens SECUterm meets 78% percent of the annual hot water demand. Fig. 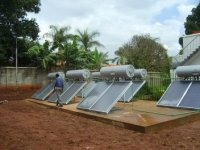 3: Test in tropical heat passed: Large scale SECUterm compound at a major Brewery in Uganda. Bilddownload 1: TZSB-Test site, Institute of Future Energies, Saarbrücken/Ger: stress test for Thermosiphon installations. Bilddownload 2: Fig. 1: Above approx. 85°C the thermostat shuts off the circulation. Vapour forces the solar liquid into the tank. Bilddownload 3: Fig. 2: In Athens SECUterm meets 78% percent of the annual hot water demand. Bilddownload 4: Fig. 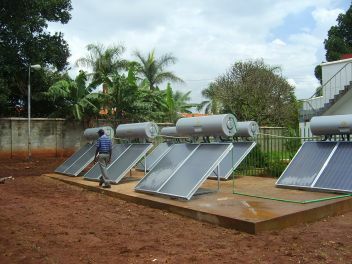 3: Test in tropical heat passed: Large scale SECUterm compound at a major Brewery in Uganda.